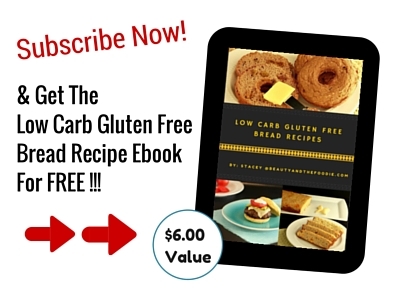 Grain free, gluten free, primal, low carb, keto with paleo option. 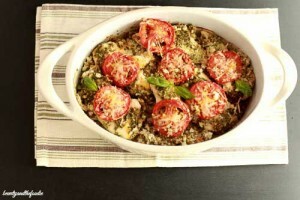 Chicken Pesto Cauliflower Rice Bake is an easy, all in one pan, flavorful dish to whip up for dinner. 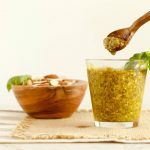 I made the pesto myself (it is super easy to make), because it is hard to find store bought pesto that has not been exposed to wheat on shared equipment. I also made mine with almonds instead of pine nuts for the same reason, as many pine nuts are processed on shared equipment with wheat. 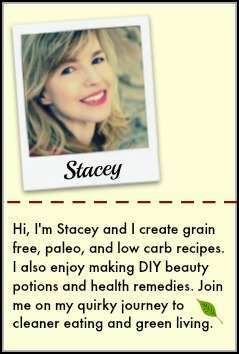 You can use store bought pesto if wheat is not an issue, or you have access to a gluten free brand. You can also use pine nuts in place of almonds as well. I looked all over for GF safe pine nuts, and could not find them where I live. The toasted almonds taste as good pine nuts in the pesto, so I was very pleased with it. 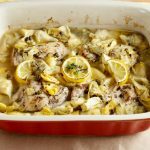 Even the hubby liked this recipe, and he is not a fan of chicken, cauliflower or green, lol. I’m still in shock he tried it, as he would usually turn up his nose at anything with pesto. He must have been starving, but he ate every bite! 1 ½ cups cauliflower florets, riced and microwaved or steamed for a few minutes. Add almonds and all the pesto ingredients to a food processor, and pulse until combined and texture of pasty sauce. Pour into a bowl and set aside. 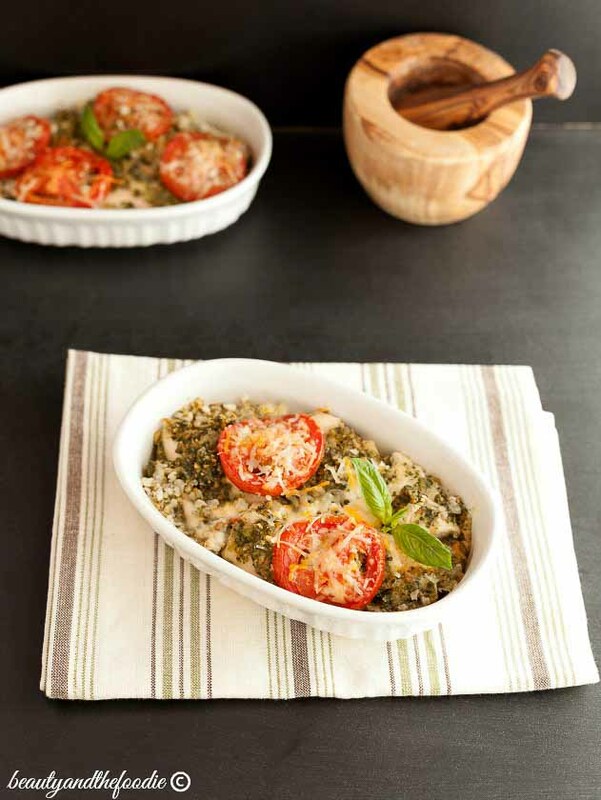 Skip above directions if using store bought pesto. In the same processor (no need to rinse out), add cauliflower florets and pulse until texture of rice. steam or microwave for 3 to 5 minutes until semi soft. 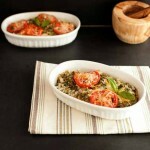 In a 9×13 baking pan or casserole dish, pour about a ⅓ cup of the pesto sauce into the dish and spread around the bottom of the baking dish. 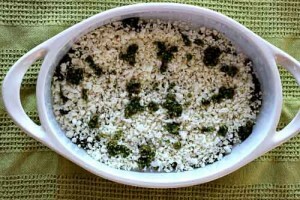 add cauliflower rice to the baking dish over the sauce. 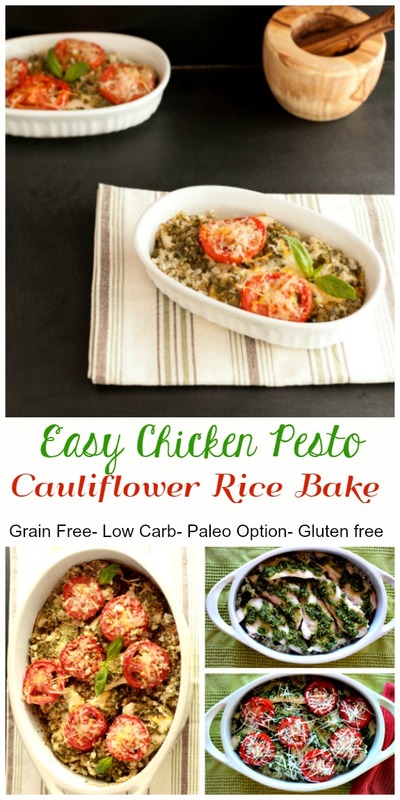 Add a couple tbsps of pesto to the top of the cauliflower rice (as seen in photo above). 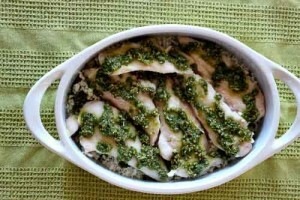 Place chicken breasts on top, and add a tbsp of pesto to the top of each piece of chicken (as seen in photo above). 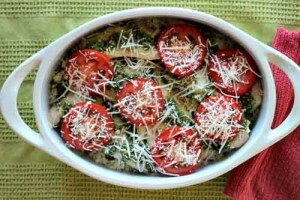 Place tomato slices on top and sprinkle grated mozzarella cheese over the top. Bake for 35 to 45 minutes, or until chicken is done (depends on whether fresh or frozen and chicken thickness). 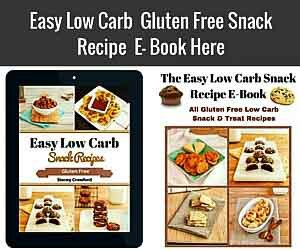 Nutritional Data (includes cheese addition): Serving Size: one portion out of 5 servings, Cal: 475, Carbs: 7 g, Net Carbs: 4 g, Fiber: 3 g, Protein: 30 g, Fat: 35 g, Sugars: 2 g.
Add almonds and all the pesto ingredients to a processor, and pulse until combined and texture of pasty sauce. 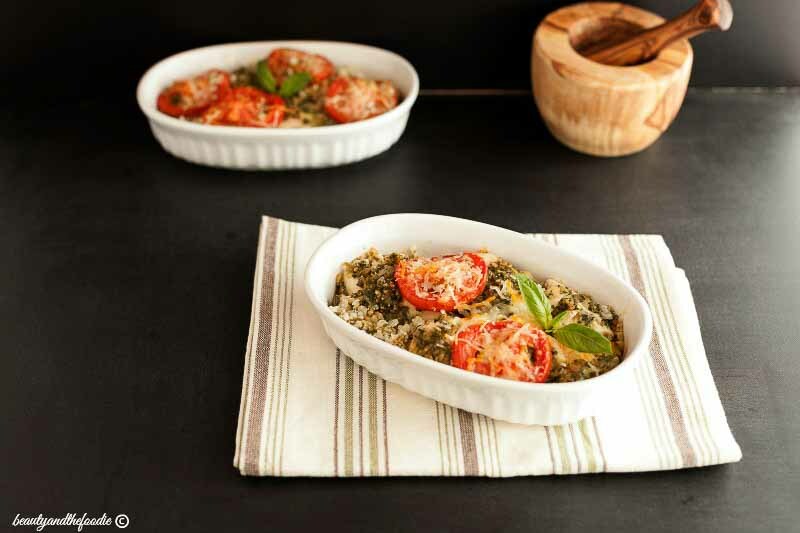 In a 9 x 13 baking pan or casserole dish, pour about a ⅓ cup of the pesto sauce into the dish and spread around the bottom of the baking dish. this is delicious. I used feta cheese instead of mozzarella cheese and cherry tomatoes is was amazing. Thanks Michele. 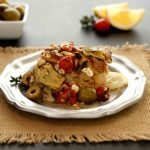 Feta cheese is a great swap idea! This sounds delish. I have a question. I have seen different types of riced cauliflower. Most people I know squeeze out the moisture after microwaving with cheesecloth. You didn’t mention that. Have you tried that before? Karen, I do sometimes, in some recipes drain the moisture out with a cheesecloth or paper towels, but in a casserole where it’s being baked, I find it does not need it. 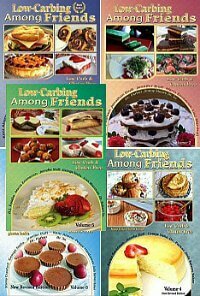 Ohh wow, what a delicious recipe! I’ve never made my own pesto before but I’d love to try this. It looks so refreshing! 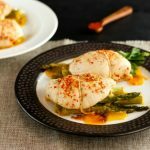 I love all the flavors and everything about this dish! Cauliflower rice for the win!